When I turned 8 years old, my parents gave me a stack of brand-new (CD!) computer games for my birthday that year. This was a pretty big deal not only because CD-ROM drives in computers were the new big thing but because of the new personal computer experience; along with the addition of speakers, personal computers became interactive, with sound and animation. All of the games I got that year took advantage of the new sound and video capabilities of home computers. I have no idea what those games actually were, except one – the “Undersea Adventure”. Ocean science research is a diverse and exciting field, but so are the people behind the discoveries. The scientists aren’t the boring looking people they showed us in school; they wear wetsuits, go diving and work on boats. They love their job and what they are learning. Photo credit: Mallory Watson. I always point to this as the first time I knew I loved science and the first time I realized that you could have a job studying the ocean. While the excitement has molded itself over the years into a more specific career, I’ve never forgotten what an impact that – seemingly silly – game made on me. Of course, not every student has a moment like this. In fact, engagement in STEM fields is dropping in the middle school grade level at an alarming rate. Science is facing an uphill battle as public understanding and trust in science slips, all while many of the most critical issues facing society are rooted in scientific discovery and education. Improving science literacy and changing negative perceptions of science is not a simple fix. It cannot be done by one individual or group. It will require a change in the way the scientific community engages with the public and communicates it's work. We’re seeing the shift already, as more blogs – like FTDM! – appear from labs, outreach efforts build a dialogue with the public, and scientists integrate public engagement and communication efforts into their research. There’s still plenty of work to be done. Last year, the Ocean 180 Video Challenge was introduced as a way to help scientists communicate their research to the public in a new way. Ocean scientists were challenged to create 3-minute video abstracts, explaining the significance and importance of a recent publication. The top 10 finalists, who represented 10 different fields of ocean science, were viewed and evaluated by over 30,000 middle school students around the world. These students ultimately selected the entries which best communicated the work of the scientists, awarding them with cash prizes totaling $6,000 (and a few 1,000 comments and critiques). Students cast their vote and submit their critiques of the videos submitted to Ocean 180. Shown here are two of the students that were from a participating 6th grade classroom in Stuart, FL. Photo credit: Mallory Watson. Scientists who submitted video abstracts faced a demanding challenge: summarize a full publication and perhaps years of work in just 180 seconds, while making the subject interesting and sharing their own personality in the video. All of this was to be done for a non-scientific, and notoriously critical, audience of 10-13 year olds. 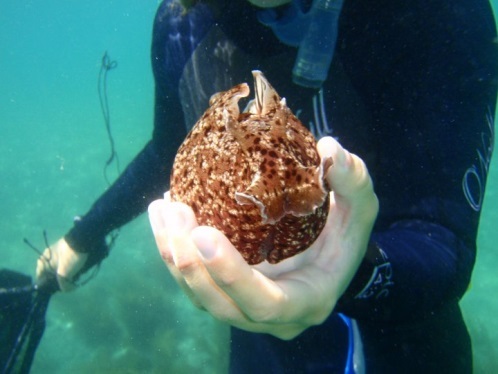 Yet, scientists in chemical and physical oceanography, deep-sea research, marine biology, and ecology rose to the challenge and the response by students was overwhelmingly positive. Their biggest complaint? Not seeing enough of the scientist. In reading through the 1,400 ballots we received, students frequently mentioned they wanted to know more about what the scientist looks like, what their job is like, and how they can become a scientist too. These comments reminded me of my first interactions with ocean scientists. Students remarked that the top 3 videos “explained who the scientist was”, exploring things they “never knew existed”, and made them “want to learn more”. Just like the scientists on my old computer game, they made science, sometimes an abstract and foreign subject, into a very human experience students could relate to. 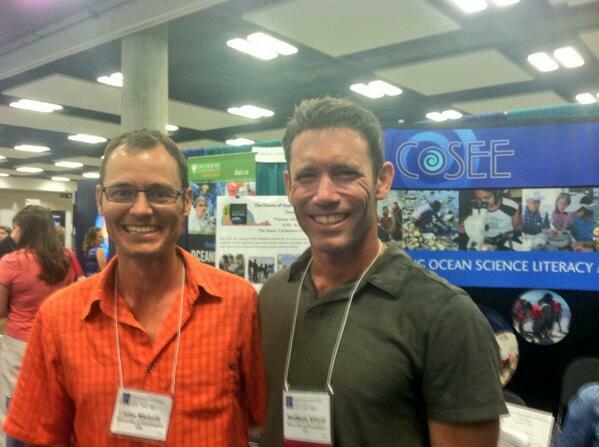 Dr. John Mickett (left) and Dr. Matthew Alford (right) from the University of Washington, creators of the winning video Wavechasers and the Samoan Passage of the 2014 Ocean 180 Video Challenge. Their team’s video abstract, discussing research of internal waves, received top votes from nearly every classroom voting. Check out the video here: http://ocean180.org/previous-winners/video-abstract-entries/video-9.html Photo credit: Mallory Watson. Despite prevailing stereotypes (and our sincere wishes), scientists are not all-knowing or perfect. Science is driven by human inquiry, passion and mistakes, as well as successes. Exposing the individuals and excitement behind science makes it far more relatable, something a young students (or adult) can connect to on a personal level. As we build communication capacity in scientist today, it’s important to remember to share the human element of our work. Research is exciting and valuable, and so are the scientists behind it. The Ocean 180 Video Challenge is at it again this year, looking for ocean scientists to share their recently published research with thousands of middle school students around the world. It’s an opportunity to share your work and excitement for research with others, to develop your skills in science communication, and to be a part of the science community working to make science more relatable. Imagine if just one student, somewhere in the world, sees your research and tells their parents they want to be like you when they grow up. Mallory Watson is a scientist with the Florida Center for Ocean Science Education Excellence (COSEE Florida) passionate about scientific communication and Ocean180's mission to improve science communication.